It's been several weeks since I participated in Presto Pasta Night. My cooking hasn't been interesting lately, to tell the truth. But, when I saw this recipe, it seemed promising. It's very quick and the dish can be served at room temperature. And angel hair pasta cooks so quickly, it doesn't heat up the kitchen. I wish I could have used red bell peppers from my garden, but they're the size of cherry tomatoes right now. Instead of roasting some peppers from the store, I used very good bottled roasted peppers that I like to keep on hand for quick meals. This week PPN is being hosted by it's founder, the wonderful Ruth at Once Upon A Feast. 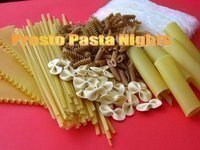 Stop by her blog and check out the recap of wonderful pasta recipes from bloggers from all over the world. 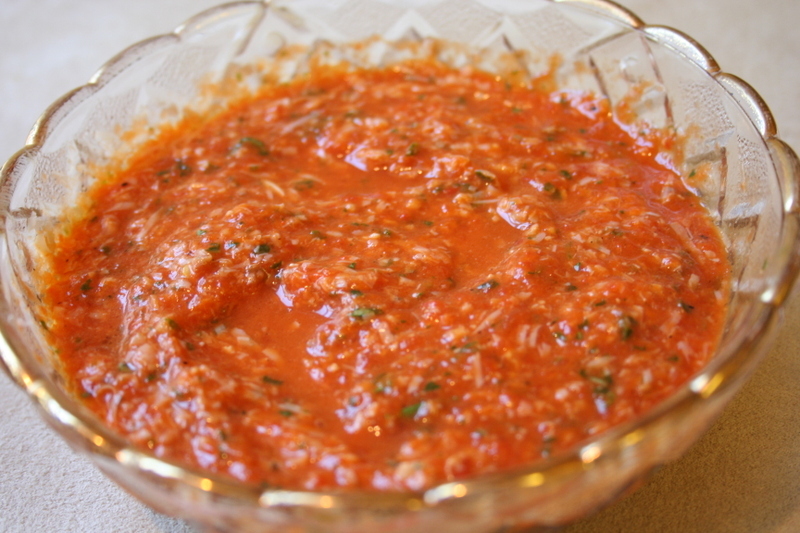 Transfer the peppers and pine nuts to a blender or food processor. Add the garlic and whole basil leaves and blend until coarsely chopped. Add the olive oil and cheese and puree to a chunky pesto. Season with salt and pepper. Sher you always manage to make pasta look brilliant! Very interesting to serve room temp. That pasta dish looks extremely scrumptious! I love the taste of bell peppers, so that pesto would be for me! You always make the most delicious pesto sauces, Sher! And I love angel hair pasta! 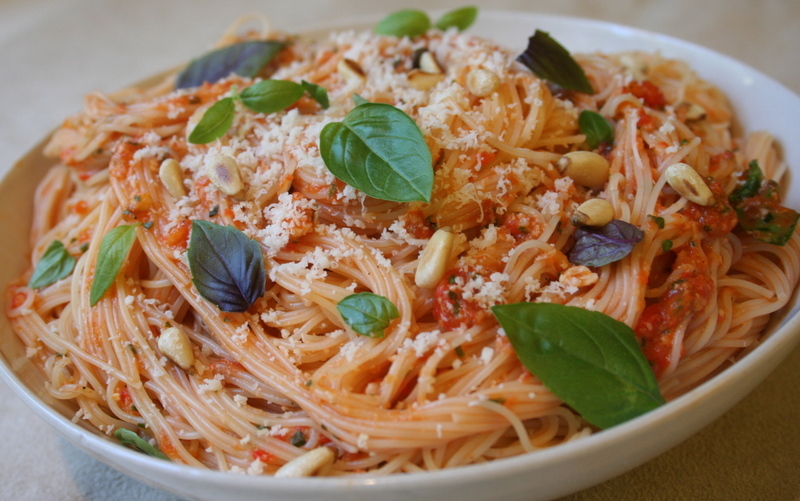 I did a pasta with red pepper sauce this past winter and just loved it. Once red peppers are all over the local farmer markets, I will do it again. I'm pretty sure we followed the same recipe too. I'm always intrigued by other pestos besides the regular basil pesto. This one sounds so delicious! I just tried your recipe with Al Dente's Egg Linguine which cooks in just 3 minutes and tastes exactly like homemade. It was great! LCBO had a similar red pepper pesto that sits beside the usual basil one in my fridge. I'm not sure which I like better, but it's great to have the option no matter what my mood. Nope can't go wrong here, even w/ jarred peppers. It must be exciting watching your peppers grow! Oh, yeah!! This sounds great. I look forward to any chance to eat roasted red peppers. Dear family of Sher, reading this is probably the last thing on your minds at the moment, but I just wanted to let you know I am thinking of you all today. I am so shocked and saddened to lose Sher, a vital and engaging presence. My best thoughts are with her family at this time. Rest in peace, dear friend. You and your wonderful columns will be sorely missed. I always knew you as a the wonderful and kind soul you were to all of us! We will miss you forever! Our deepest and heartfelt condolences to your family! Just had to come and visit you one more time! My sincerest condolences to Sherry's family and friends. She was a wonderful presence in the food blog world and I truly enjoyed reading what she wrote and getting to know her. My thoughts and prayers are with you all. She will be missed more than mere words can express. Today is a sad day... Sher, you are going to be missed! All my condolences to her family and friends. In thoughts with you. I'm so sorry to hear the news. My heart goes out to her family and friends, and I hope you find comfort in beautiful memories. I am afraid we have only every been lurkers on your lovely blog, but we were sad to hear the news today on the cat blogosphere. Sending our thoughts to your friends and family and we will miss your warmth and prescence in the blogging world. We are so very sorry for your loss. We enjoyed this blog and know that Sher was a wonderful human. All of our sympathies to you at this most sad time. Perfectly Parker and her family. I was so sad and shocked to hear this news today. I will miss the recipes, the wonderful pictures, the kind words and comments. Oh Sher, we will miss you so. We'll light a candle for you. To Sher's family, We're so sorry for your loss. Sher I know you can't read this but I will miss you. very much. Farewell, my friend, for now. This is such a sad day. You will be greatly missed by so many. My heartfelt prayers and condolences to your family. I'm certain that Upsie and Sundance were there to welcome you. Sher's Family - our thoughts and prayers are with you during this very difficult time. Sher will be greatly missed. Please accept our condolences. Sher's family: I was deeply sadden to hear the news about the loss of Sher. Having read her blog for quite sometime I know she was a warm and loving person. All the best to you as you get through this difficult time. We are so very sorry to hear about Sher. You are all in our thoughts and prayers. She will be greatly missed. My thoughts are with everyone who knew her and loved her, she was truly an inspiration to me and my family night dinners and I loved her recounts of daily life. You will be missed, Sher. We will always remember Sherry as a nice loving and caring person who made Lizzy and Julie's birthday cakes! Also the Woman of amazingness!! She took in Rolly for Julie and turned him into a magnificent bird! We will keep everyone in Prayer! I'll miss my very intelligent, caring, wonderful, beautiful, creative cousin. What a special person Sher was to all of us. She loved people, animals and food and most of all I think she loved great conversation.